New in our Spring/Summer line of Haute Savon (exclusive artisan soap). There is a certain grocery store that has the most divine raspberry and lemon cake. It’s as light as air and melts in your mouth. To pay homage to this extraordinary dessert, we have made our extra large cupcake soap as a tart! Starting with a layer of raspberry cream topped with lemon, our tart is covered with a center of raspberry frosting stars and edged with creamy yellow frosting stars. 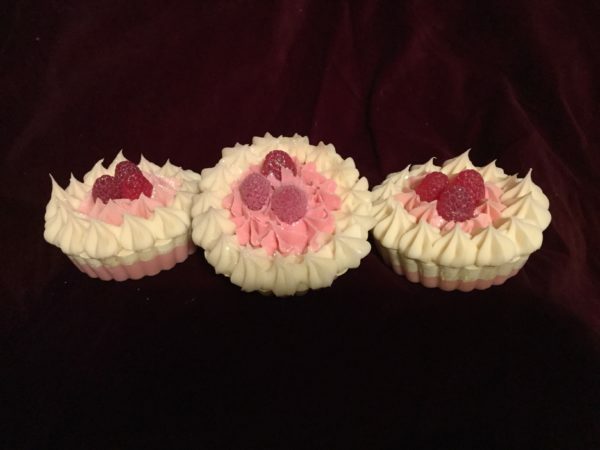 Three luscious berries in the center and shimmer glitter finish this adorable tart cupcake soap. Packaged in a cupcake box!